3.6 out of 5 based on 54 bloggers and 14 commenters. 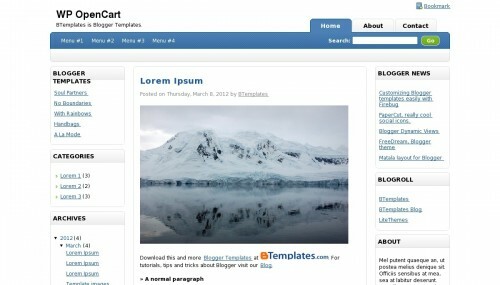 WP OpenCart is a free blogger template adapted from WordPress with 3 columns, left and right sidebars, rounded corners, drop down menu and simple look. I’m using your template and it fits perfectly! How to use dropdown menu? can u post the instruction too? You have to go to your blog dashboard, template, edit html, and then look for “Menu 1”. hello admin. i need some help regarding the content and the widget above and below blog post i want it to be separate just like the right side bar just like individual. thanks hoping for your prompt attention! The default blogger Lightbox doesn’t work with this template. Anyone knows how to fix it? I want to add page navigation, but i could not find a working one. Could you help me with this problem? is perpect template a like this.. User friendly template. Thank you so much for sharing…..